Anyone working with pallets or cases will understand the necessity of having the right tools for the job, especially in high-pressure environments where the focus is on completing the task as quickly and efficiently as possible. 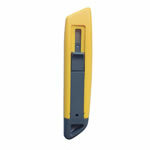 These case cutters with retractable blade are readily available and are a great tool for use warehouses or storerooms. They are also popular with employees who are out on the road delivering goods and shop owners and retail staff who are responsible for taking delivery of goods. The provision of a retractable blade means that any health and safety issues are properly addressed. For user convenience, the cutters are available as right-handed or left-handed operation. The needs of left-handed workers have not always been addressed in the past, so this tool is a welcome addition to a growing list of tools designed to overcome the issue. For convenience, the case cutters are available to buy in handy packs of five. These cutter tools are highly functional and effective, with the angled guide offering protection to the user from the blade, while at the same time working as a guide for the cutting open of case tops. The blade has no less than three lockable positions, which adds to its functionality and enables users to adjust the blade to suit the type of case they are opening.